Dr Michelle Heward represented the Ageing and Dementia Research Centre (ADRC) at the ‘Employing Information and Communications Technologies in Homes and Cities for the Health and Well-Being of Older People’ (ICT4HOP ’17) workshop in Bradford on 14-16 August 2017. Michelle received funding from the British Council Researcher Links scheme within the Newton Fund to attend this 3-day multidisciplinary workshop. 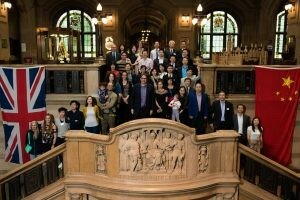 The workshop provided Early Career Researchers from the UK and China a unique opportunity to network and share their research expertise. Michelle presented her research on ‘the significance of lived experience when developing technological innovations to support health and well-being in later life’. Researchers were also treated to dinner with the Mayor of Bradford in the Town Hall and fish and chips at Bolton Abbey. Thanks to the workshop co-ordinators Prof Ray Sheriff of University of Bradford and Prof Xiaohai He of Sichuan University, and to all those who contributed in making the event informative and enjoyable. This Workshop was funded under the UK-China Research and Innovation Partnership Fund, a part of the Newton Fund, and the National Natural Science Foundation of China. Building on a previous Workshop in Chengdu, China, ICT4HOP’16, held in August 2016. For more information, please contact Dr Michelle Heward at mheward@bournemouth.ac.uk.